In April of 2017, I was preparing to graduate from Kutztown University. With only one month left, all of my remaining energy was focused on soaking up any knowledge and practice I could get out of my last few weeks of classes. My professors often encouraged us to find new languages and meanings for our artwork, but I was always focused on the question of how I was going to start an art career after school. 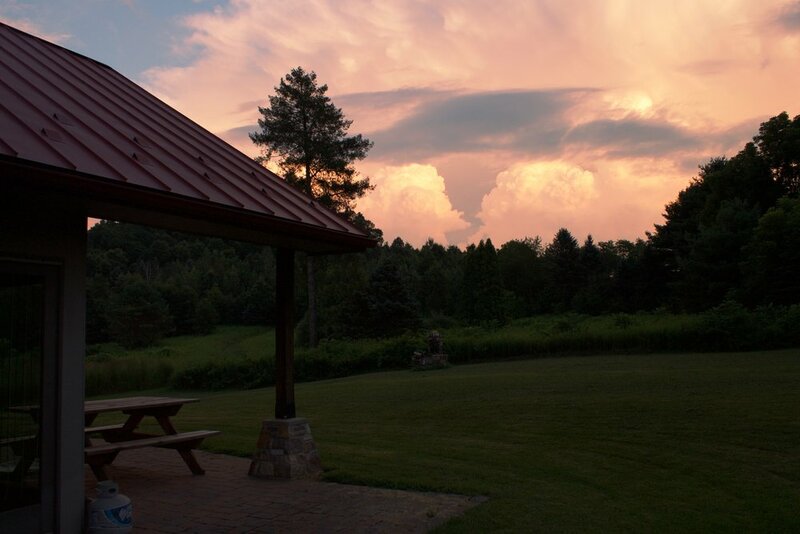 Luckily for me, I had helpful advisers that suggested the first step: apply for the Hawk Mountain Artist Residency. By August, I had moved into the Acopian Center for Conservation Learning alongside a few education interns and trainees. In the beginning of my two month stay, most of my time was spent driving and taking pictures. I photographed gas stations, overgrown backyards, and some quiet factories for reference. I was accustomed to painting in my familiar language—tattered, small town landscape—despite being surrounded by a grand new landscape full of life. But, as expected, plans change. I considered painting the sociopolitical exchange between Berks and Schuylkill inhabitants, but after a couple weeks, I realized that this was neither compelling nor could it be explained well without painting the people themselves. I was, however, still interested in the image of the two counties dividing the mountain in half, and how differently they appear. One was comforting and folksy with wide farm fields, and the other was commercial with numerous strip malls, restaurants and supermarkets. But something still felt missing. Day by day, I did a mixture of drawing, hiking, painting, and photographing. Being a part of this environment, where every day the interns were discussing migration, the daily bird sightings, and the importance of conservation, I was noticing the small glimpses of life. I hiked the mountain on my own and observed that everyone, from the experienced birder to the novice visitor, was interested in learning about the raptors. All of this was new to me because, prior to my stay, wildlife painting was not as meaningful to me; yet now, I wanted to talk about it. I wanted to learn how raptors travelled, how they hunted, when I could see them. I knew that my paintings would have to focus on the migration. When the interns returned to the residence, I would often ask them about the birds they saw that day. They told me what was travelling through the area and how to identify raptors, and I would look for them when I photographed. Unsurprisingly, certain birds would make their way into my paintings. Every new painting made me think about what bird was active at that time, or what kind of raptor would be common in the scene I was forming. 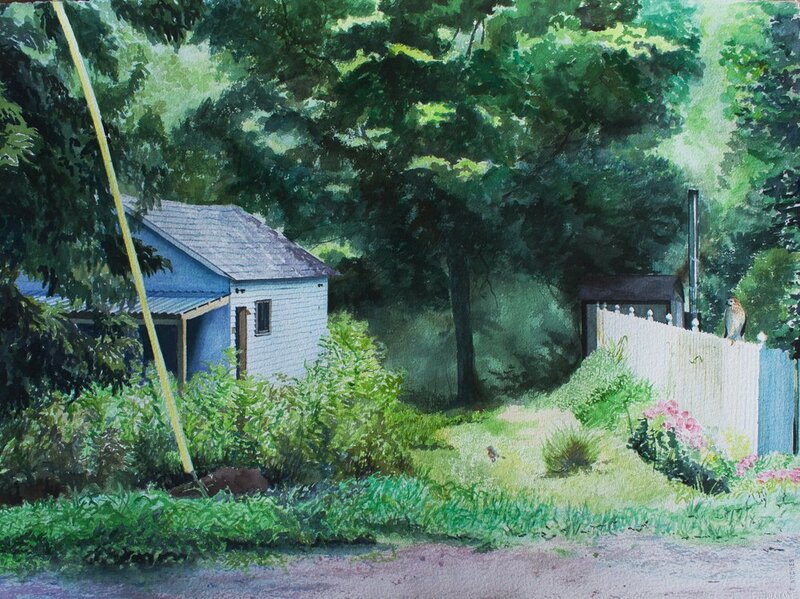 For example, I labored for weeks on one watercolor that was filled with branches, flora and tall grass, but in this scene, I was drawn to a white fence that felt like a perfect place for something to be perched. I asked many of the resident scientists what would be seen sitting so obviously in the open, and was the right size for the fence. All of them agreed that a Coopers Hawk would be the perfect fit, so I painted a Cooper’s Hawk looming over its prey. It was finally concrete in my mind that all of my work was a spotlight on the raptors and the unique places they inhabit. I decided to take advantage of my location and began painting on site. I painted at North Lookout a few times to make a rather simple but warm depiction of the rising sun. This inspired me to start painting the other lookouts and expand the flow of this series to include sites from the Mountain. 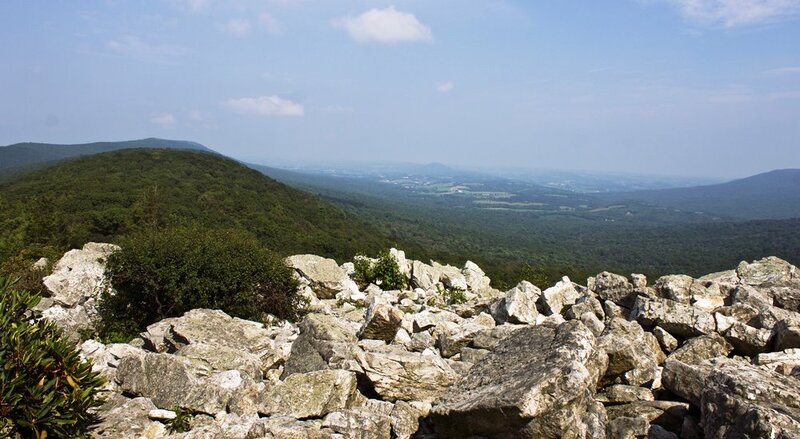 Each lookout, such as North Lookout, the Kettle View, the River of Rocks, and the Lookout Trail, offered insight into the geographic layout of the land. 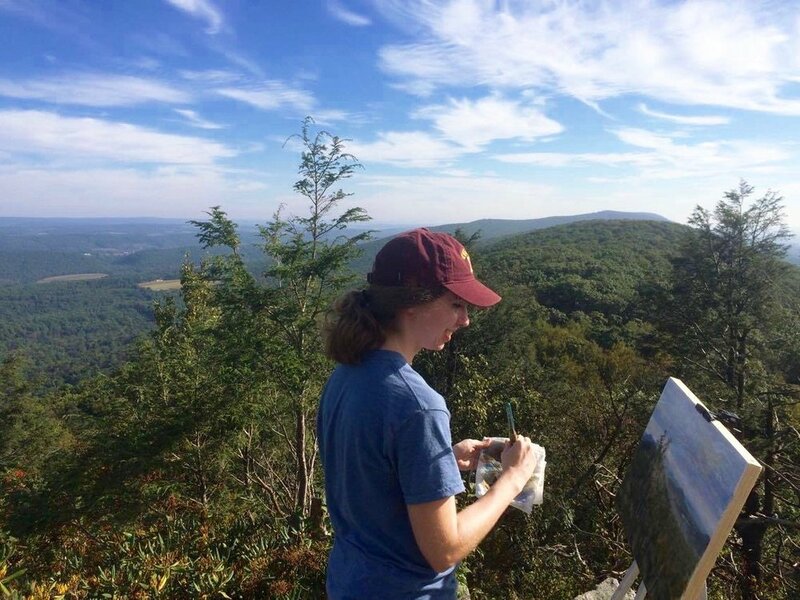 These sights from Hawk Mountain's own trails bind together the paintings from off the Mountain and showcase that raptors have traveled hundreds of miles to make a temporary home with us in our wildly varying landscape. This is the idea that countries, states, and counties are all sharing the opportunity to look up and experience the birds during migration, and now I have the opportunity to share those glimpses in visually compelling ways. What the Sanctuary offered to me was an invested look into how birds are counted, identified, and studied every day. It taught me to be open-minded with my plans, and never closed off to changing my inspiration. I always felt that I painted subjects that were underappreciated, and now I know to keep my eyes up to the things that I myself have ignored. Thanks to the work of many, I can share what should be adored in the quiet Pennsylvania landscape of Hawk Mountain, and a new love of wildlife and narrative. 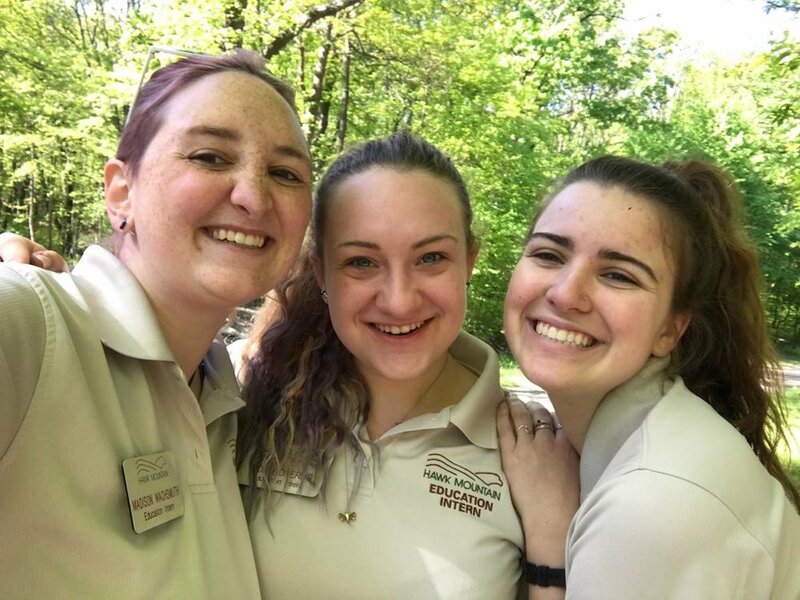 Hawk Mountain Sanctuary brings joy to visitors on a daily basis, and I am proud to say that now, I can bring this joy wherever I go. Come and experience the incredible series of work that Abby created during her time at the Sanctuary at her art show entitled "Sharing the Birds," which will be on display in the Hawk Mountain Visitor Center Gallery from August 19 to September 15, 2018. It will be free and open to the public. All photos and art by Abigail DeVizia.